Do I need to pay to file a Trade application? No. Once your Trade application has been processed and verified you will receive a welcome email that includes your account number. Processing takes 48-72 hours. Yes! We work with interior designers to meet their needs in order to succeed. Go to our Trade Program Application Form. 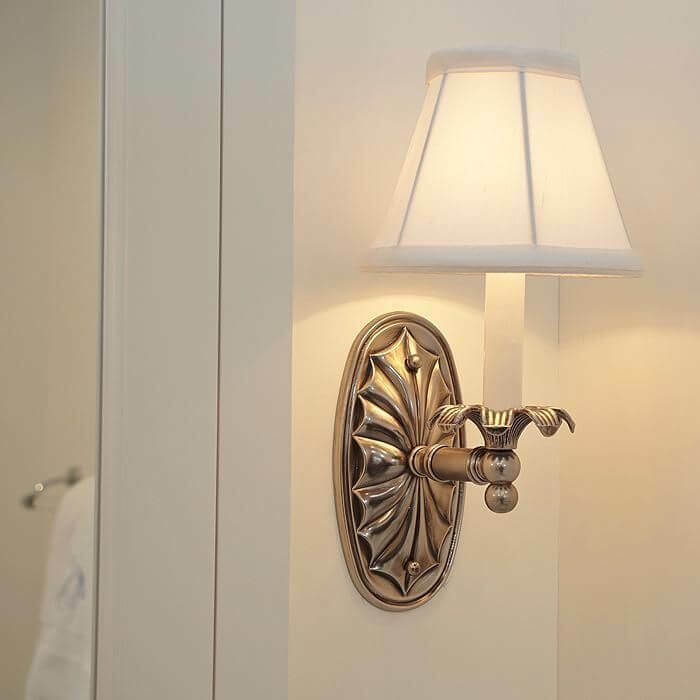 Is your Oval Linen Fold Sconce with Electric Candle available as a Hurricane Sconce in Polished Brass metal finish? Yes, all of our lighting is made-to-order in our Milwaukee, Wisconsin plant. Each Brass Light Gallery interior light fixture is available in any of our 13 high quality metal finishes, including Polished Brass. The P11440 Oval Linen Sconce with Electric Candle can be custom ordered as a Hurricane Sconce for an additional modest engineering fee. For detailed information on custom modifications of standard light fixtures, please contact our sales team. Are there different options for the support bracket on 11 inch wide and 13 inch wide Provincial Exterior wall mounted lanterns? Yes. If the scroll shaped support bracket that comes standard on larger sized wall mounted Provincial Lanterns does not work with your design, we do have a simpler option. 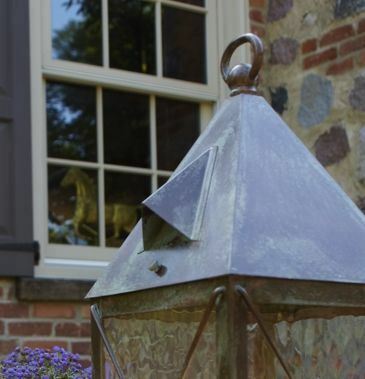 Ask our sales team about the Provincial Lantern with a custom discreet angled bracket and smooth mounting plate option. 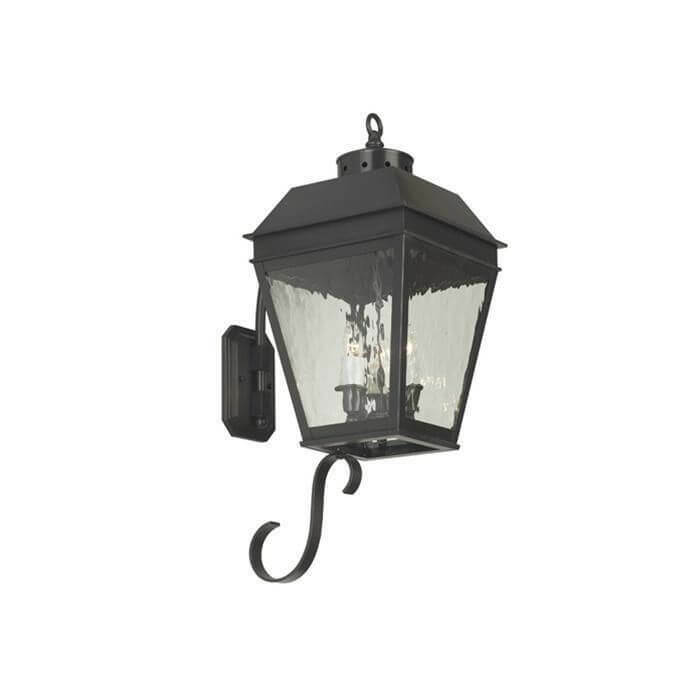 Below is a photo of a London Lantern with an angled support bracket and smooth mounting plate. Do the Provincial Lantern Curved Arm Exterior Wall Light fixtures all come with a support bracket? 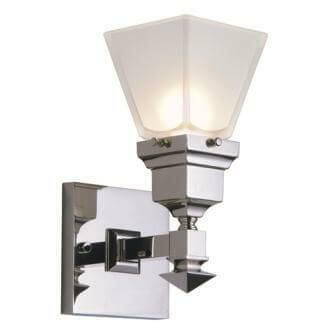 Only the 11 inch and 13 inch wide wall mounted Provincial Lanterns come with a support bracket. The 9" and 6" sizes do not need the bracket as they are considerably lighter. Are Brass Light Gallery Lanterns available in Antique Copper metal finish? Can I use an LED in the European Country Lantern Pendant? 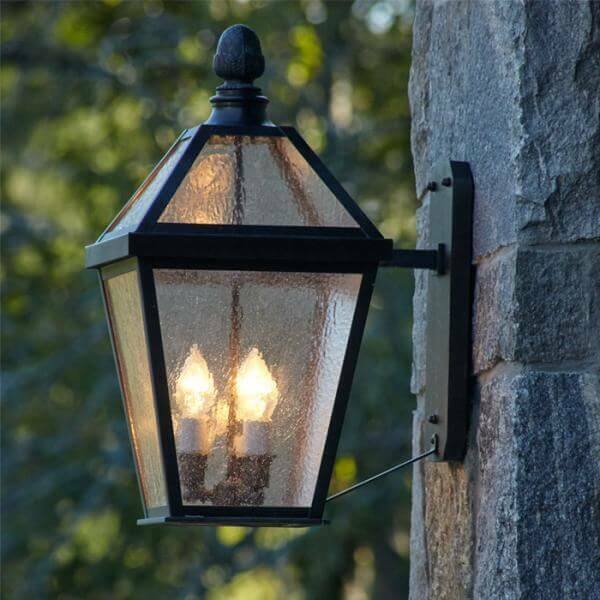 All of our exterior lanterns are compatible for use with incandescent, CFL or LED bulbs interchangeably, so its just a matter of personal preference. When considering LED bulbs, we recommend a 2700K color rating to achieve a warmer light. This rating scale can be found on the box with the wattage equivalents. 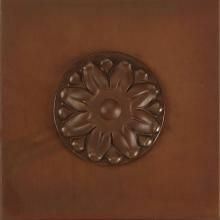 The type of art glass panel you choose for your lantern can affect your bulb choice. Translucent art glass panels such as: Gold White Iridescent, Cream, Pearl, Honey Ripple Opaline, Moonlight Billow, and White Opal mask the bulb. More transparent art glass panel choices such as Waterfall, Clear Seeded, and Fountain soften the bulb, but it is still visible through the glass panel. Is the European Country Lantern available with Overlays other than the standard Truss Overlay? Yes. Occasionally customers request custom Overlays for our handcrafted European Country Lanterns. To determine whether your custom Overlay request for the European Country Lantern can be fulfilled, please contact our sales team with the details. Can I order my lanterns with a Custom Overlay? Yes, lanterns and lantern light fixtures can be ordered with a Custom Overlay. Please contact our sales team to find out how to order Custom Overlay for your indoor and outdoor lanterns. 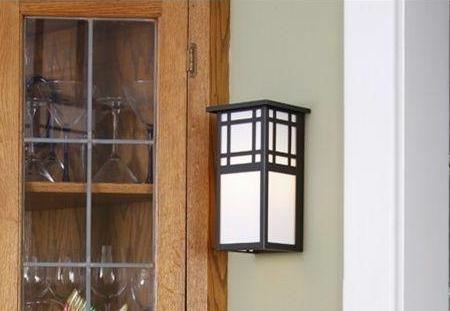 Many of our indoor and outdoor lanterns offer an Overlay choice. Overlay is a decorative design element that is placed over the Art Glass Panels and built into the frame of the lantern. The Overlay emphasizes certain architectural styles. 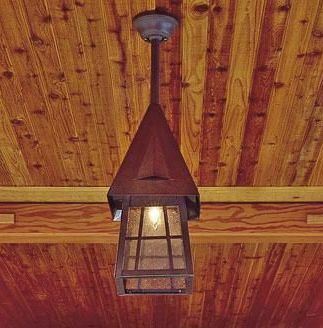 For example, our Studio Lantern family offers Prairie Overlay (Prairie Style), Foursquare Overlay (Craftsman Style), Macintosh Overlay (Arts & Crafts), and No Overlay (Modern/Contemporary). Depending on the details of your home such as the shapes or panes of windows, wall cladding, or other considerations, the Overlay will complement the architecture. If you need assistance choosing the best Overlay for your interior or exterior lanterns, please contact our sales team for expert advice. 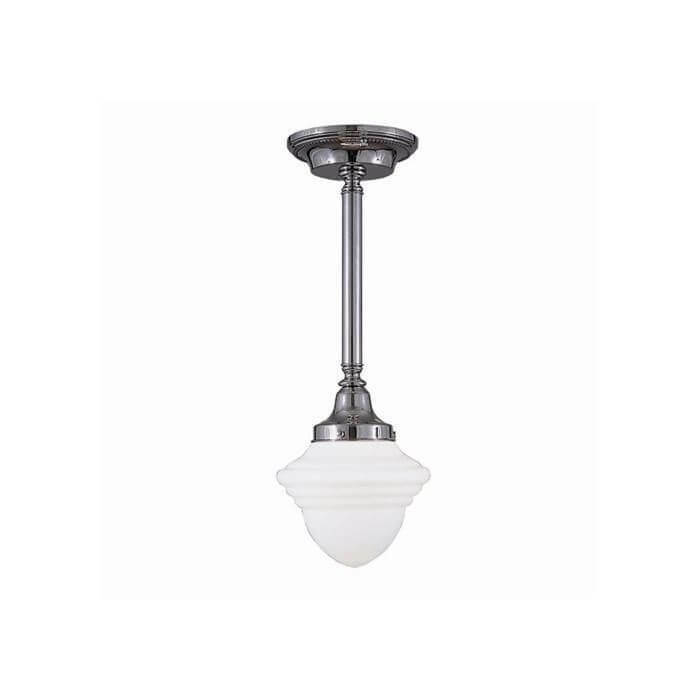 Is there an option for length on your alabaster light fixtures. Yes. 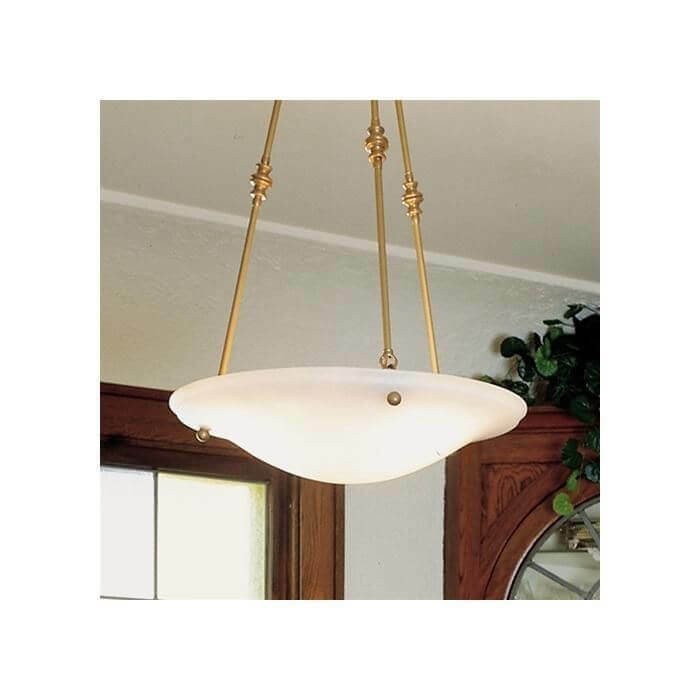 All of our alabaster pendants and chandeliers include your choice of overall length and metal finish options for the solid brass fittings. If you need help determining the correct overall length for your alabaster light fixture, please call or email our sales team with your questions. We have years of experience helping customers determine the correct light fixture length for every size room and ceiling height. What is the lead time for Brass Light Gallery's interior light fixtures? In general, we ship interior lighting within 2 to 3 weeks. Our made to order, made in Milwaukee lighting includes your choice of metal finish, overall length, and shade option. 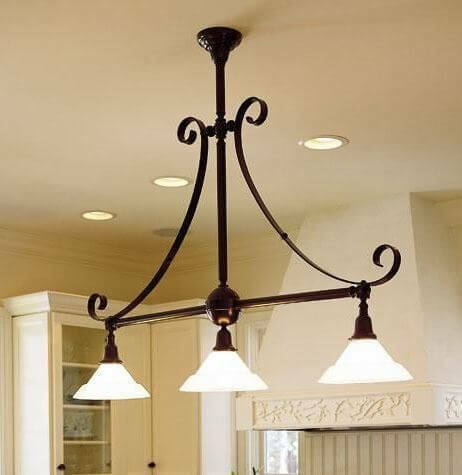 How much does the Scroll Arm French Country Style Kitchen Island Pendant Weigh? Our French Country Style Kitchen Island Three-Light Pendant weighs between 15 to 20 pounds with glass shades. The model number is CN-450-A4-03M and the name is Shoreland Three Light Scroll Chandelier with 2-1/4" shade holders. Are all your Alabaster Bowls the same depth? No. Depending on the style and size of the Alabaster Bowl, depths vary. For example, the depth of the 16 inch diameter Navarra bowl is 5 inches and depth of the 19 inch diameter Navarra bowl is 4.25 inches. To check the depth of any of our genuine Alabaster Bowls, please contact our Sales Team. Will Brass Light Gallery send me lantern samples to help determine the correct scale? Yes. We regularly send homeowners, landscape architects, and residential and commercial architects lantern samples to help determine the correct scale of outdoor lantern for their unique situation. Generally, we send lantern samples at no charge to qualified buyers in the lower 48 states. In addition to helping determine the correct scale, our lantern samples convey the top quality of our handcrafted, made in Milwaukee light fixtures. 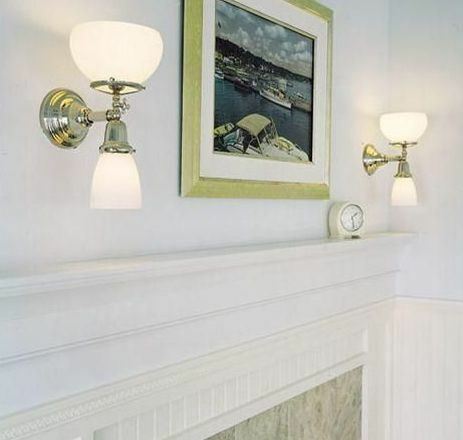 Do you sell Gas-Electric Wall Sconces? Yes. The designs of our handcrafted made to order Gas-Electric Wall Sconces are based on original antique Victorian and Arts & Craft light fixtures. Each of our Gas-Electric Wall Sconces is available in 13 high quality metal finishes and with a variety of shade options. See our Victorian Two-Light Gas-Electric Sconces and our Summit Two Light Gas Electric Sconces to choose the best option for your interior style. Do Brass Light Gallery light fixtures ever go "On Sale?" We are a lighting manufacturer that sells direct. This keeps our quality high and prices fair. In certain cases, Brass Light Gallery can offer a modest discount, especially for large volume orders. To see if your order qualifies, please contact our sales team at 1-800-243-9595. 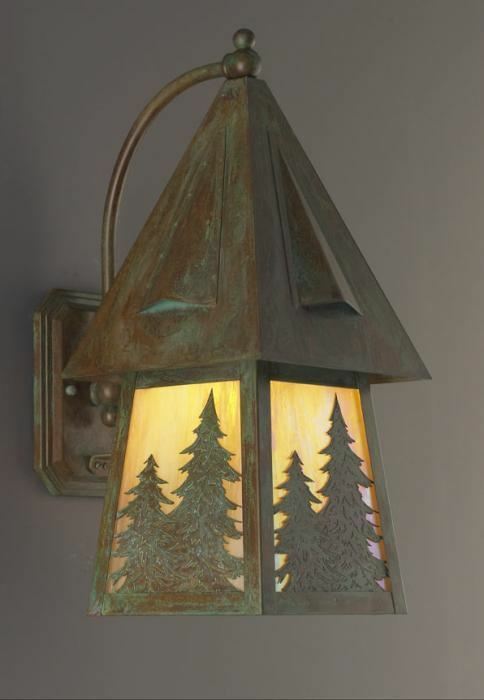 Will Brass Light Gallery provide replacement Set Screws for my outdoor lantern? Yes. In general, we are able to send you replacement Set Screws for your Brass Light Gallery exterior light fixture. Please contact our sales team with the metal finish and quantity of Set Screws needed. What is the maximum wattage for your vintage Enamel Pendants? 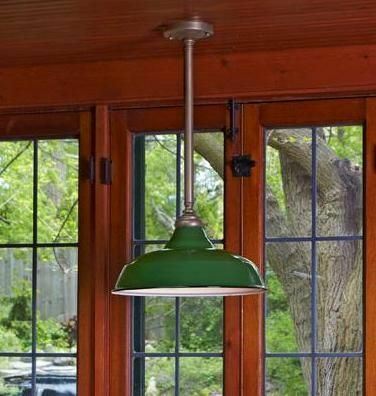 All of our vintage Enamel Pendants accommodate (1) medium base incandescent lamp. Our vintage Enamel Pendants are wired with high quality electrical components and provide ample task lighting. All of our vintage Enamel Pendants are UL listed and tested in our Milwaukee factory and are up to modern electrical standards. Can we use and LED bulb in the Carlton Pendant with Globe? Yes. Our Carlton Pendant Lights with enclosed globes are UL rated for a 100 watt incandescent bulb. LED bulbs give off much less heat than incandescent bulbs. As long as you use LED lamps rated for Fully Enclosed fixture use, you should be able to use LED lamps in our globe fixtures without heat build up. Does Brass Light Gallery still have printed catalogs of your lighting collections available? Some of our printed catalogs of lighting collections are still available, however they don't contain all of the new light fixture styles added over the past 10 years. For the most up to date information, browse our website or contact our sales team if you need assistance. Does your Polished Nickel finish require polishing or maintenance? No. Our Polished Nickel metal finish is lacquered so does not require maintenance. Gently clean dust from your Polished Nickel light fixture with a dry, soft cloth. If further cleaning is required to remove spatters, dip your cloth in water with a mild dish detergent. To avoid harming the lacquer coating protecting the polished surface of your light fixture, never use harsh chemicals or spray cleaners such as Windex to clean your polished fixtures. Do you sell Brass Fittings separately from Alabaster Bowls? Yes. Brass Light Gallery will custom make Brass Fittings for your existing Alabaster or Glass Bowl. We offer a range of Brass Fittings styles from simple to ornate and all are available in any of our 13 high quality metal finish choices. To make Brass Fittings with the correct Overall Length for your light fixture, we will need photos and dimensions of your Alabaster or Glass Bowl. Does Brass Light Gallery ship light fixtures to the UK? Yes. We ship our made in Milwaukee light fixtures internationally. Depending on the destination of the light fixtures, the fixtures are wired to the standard voltage of the country. Contact our sales team to ensure the correct voltage is ordered for your lighting. Do you sell reproduction Opaline Glass Shades? Yes. We have the most authentic reproductions of Opaline Glass Shades available on the market. Our exclusive collection of Opaline Glass Shades with 2 ¼ inch fitters includes a variety of original vintage shapes such as Trumpet (A498), Swirled Chablis (A487), Swirled Bell Flower (A488), and Ruffled Flower (A491). Our Opaline Glass Shades shapes with 3 ¼" fitters include Tear Drop (B454), Swirled Tear Drop (B453), and Round Globe (B463). 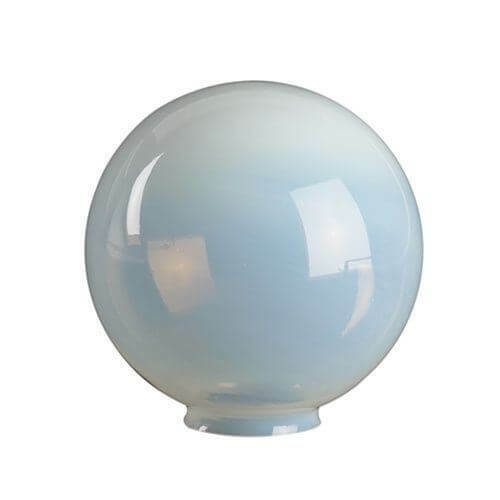 We also have a fantastic Opaline Glass Gas Shade with a 4 ¼" inch fitter. To see photos of our beautiful Opaline Glass collection, please search the shade code or contact the sales team for assistance.